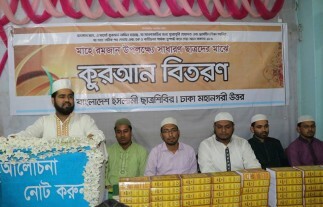 Yasin Arafat, the central president of Bangladesh Islami Chhatra Shibir, said that al-Qur'ân is not just a religious book. Rather, this great book shows the path to the deviated amongst the human race. The best provisions of human welfare. The path to welfare in life. Without the establishment of the laws of the Qur'an, it is not possible to establish the desired society. Atiqur Rahman, the Central President of Bangladesh Islami Chatrashibir, said that the Awami League forces had unleashed fearsome cruelty in order to destroy and erase the Islamic movement from the soil of Bengal on the eve of 28 October, 2006. Bangladesh Islami Chhatrashibir has strongly lambasted and protested the extra-judicial murder, in the dead of night, of two of its leaders, arrested by cops in Jhenaidah, after 25 days of detention. Yasin Arafat, the central president of Bangladesh Islami Chhatra Shibir, said that despite having the potential and opportunities, people did not attain a prosperous golden Bangla. But without an Islamic society, the desired golden Bangla is never possible. So, to build an Islamic society, its is necessary to raise public opinion on the good and the worthy candidate. Yasin Arafat, the central president of Bangladesh Islami Chhatra Shibir, said that the present leadership has failed to solve the country's problems and fulfill the hopes of the nation. People of every class and income group are living in turmoil. The main reason behind this is the moral-less unskilled leadership. Ideal leadership is needed to establish and protect people's rights. So to build a prosperous country, ideals leadership is needed. Yasin Arafat, the secretary of Bangladesh IslamiChhatraShibir, said that Mir Quasem Ali saw the vision of establishment of a welfare state. Not just content with vision, he also took steps to realize his vision of a welfare state. And due to this, the forces of evil became irked. Mir Quasem Ali was killed by the government in order to eradicate the Islamic movement of the country.